It’s been a very long time since I’ve shared pieces of my personal life. I have always been a very private person, but wanted to have a more open relationship with what little followers I have, but I was afraid. In this series I will be sharing a very painful experience in hopes that it will help others find the strength to break free from a toxic relationship. 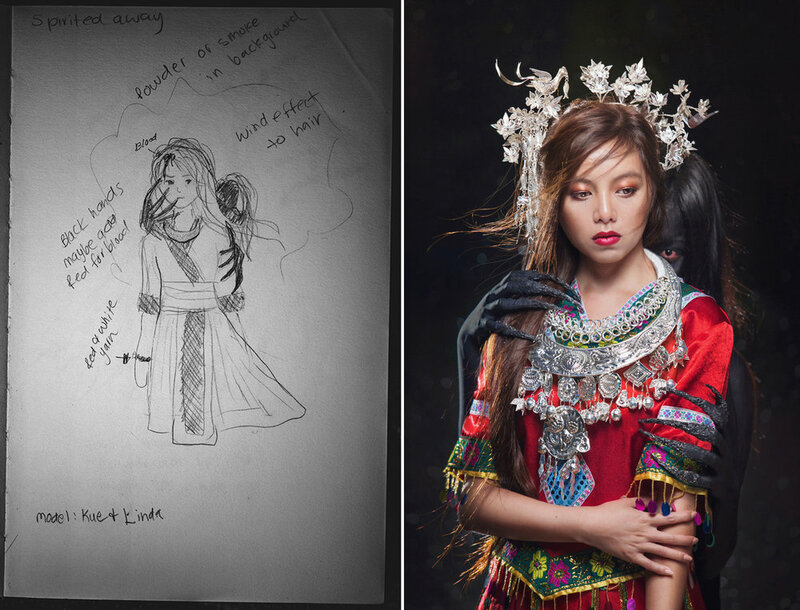 This project will include BTS videos of where I got the inspiration from, making and setting up the scenes and more. All of these clips and videos will lead to a final story time video where I explain what happened and my thought process. Disclaimer: I am not doing this project for attention to myself, since I will have to share very personal and intimate details, I would rather not even do it, but I’ve realized that this sort of thing happens to so many people and sometimes we feel hopeless. I found the strength to tell my story by watching others tell theirs, now I want to do the same for you. Art: I used to love drawing when I grew up, and remember one summer in grade school I spent my days drawing til my heart’s content . I looked around for whatever paper I could find and drew on them. I preferred drawing realistic people and charcoal was one of my favorite methods since I found it was very easy to blend the colors. As I grew older I started to become a perfectionist, when I couldn’t “get it right” I got frustrated, I hated mistakes more than anything. Eventually I stopped drawing completely, and whenever I did have to draw for class or needed to saved some ideas in my “little black book” I would purposely put very little effort into it so no one could judge me on how poorly drawn it was. Originally we planned on having a traditional dress, but that day we could not find the outfit. One of the items did not arrive on time for her hair so we had to improvise. I designed this costume that was made by my sister Linda Vang. I had thought about using dolls in place of models for my shoots for quite sometime since I can be more detailed and try multiple times even if I failed. I feel like there is a lot of pressure to get it right when I work with live models. I started off by buying the Iplehouse dolls at first, my first order for the doll and hair came out to be roughly $980, I did not do my research and found that the dolls are not that great at holding poses, I also spent another $500 buying the necessary supplies to paint their faces since they do not originally come painted. 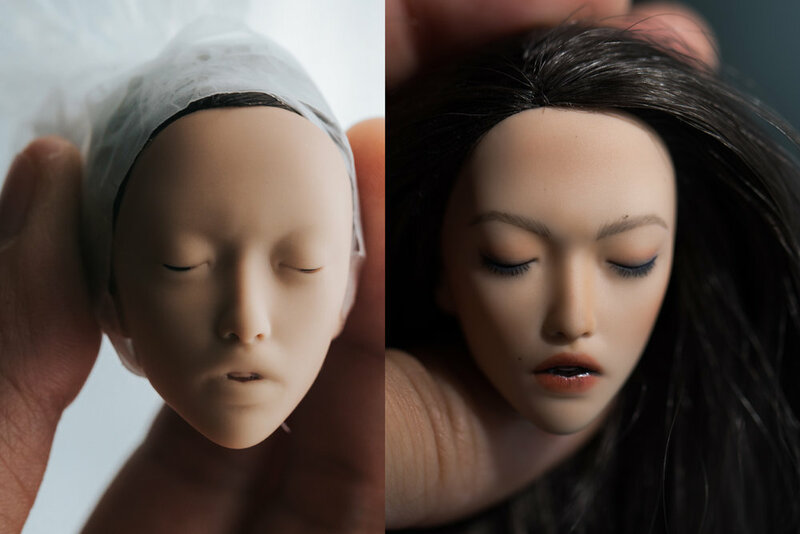 Sending my dolls back and forth to BJD artists would have costed me more in the long run, so I decided to learn to do it myself. The next important tool that is necessary for shooting dolls is the Canon L 100mm f2.8 Macro lens so that I can shoot close to the dolls, that was about another $800. After a while I started to get frustrated since everything was not going according to plan and I had already spent so much money prepping this project! The Iplehouse dolls did not look realistic enough for me and so I started to get upset that I spent so much money on them. I don’t necessarily regret buying them, I’ve always wanted them because they were very beautiful dolls, but they were not working for my project. Here is Iplehouse’s Soo and Carina. I was browsing my instagram feed when I saw these dolls, the Phicen dolls with the seamless posable bodies and immediately knew I had to have them for my project! They were extremely realistic and in some photos I couldn’t even tell if they were dolls or real people! The best part is that these are very tiny dolls, which means I can create entire sets for them! One of the heads came in and I can’t say I was too impressed by the paint job, I wish I had taken a photo, half of her eyelashes were gone and she didn’t look that great, but her face mold was superb after I wiped it clean! I used to love makeup, I spent so much money on high-end makeup and brushes, but eventually as my depression worsened I stopped putting in any effort into looking good. Slowly my makeup brushes turned into paint brushes…. Don’t judge me too hard, I think this is only the second completed faceup that I have done…I am still very new to doll face painting. 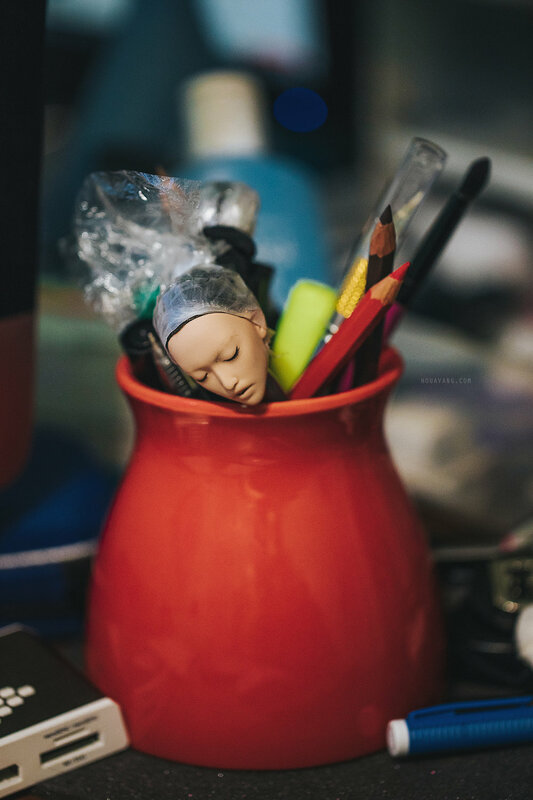 It’s important not to seal the face too many times because these dolls are very tiny and one of the problems I ran into was the sealant caking up and ruining all the work I had previously done. This series is supposed to be a personal photo project so these dolls are suppose to resemble me which is why I decided to add moles onto them. I have a lot of moles actually but these 5 are the most prominent ones on my face. I have one on my right eyebrow, one on the left side of my lips and what I like to refer to as Orion's belt on the far left on my cheek. It was originally only two but somehow I got a sun spot that now resembles a mole! I guess I was concentrating too hard looking in the mirror to see where they are on my face that I did everything in reverse! I just took these photos at my desk, using my computer as the main light source, occasionally I’ll google up a different colored background. I bought the blue flowers at a thrift store in Fresno, California earlier this year for $4. The devil is toying with my head. Her makeup is completed! I think I am satisfied for now, I am not good at drawing lips yet, but I will practice. This is just a random shoot with her Co-Star, Daniel. I am currently still waiting for her body to arrive so these two are getting to know each other a little bit more before the series officially starts.